This article describes how global admins and SharePoint admins in Office 365 can add and remove site admins (previously called "site collection admins"). 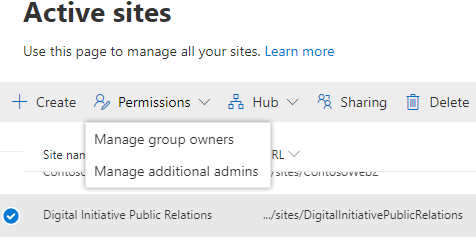 If you're an owner of a communication site, or a site that belongs to an Office 365 group, see Manage your SharePoint site settings for info about giving people access to your site. 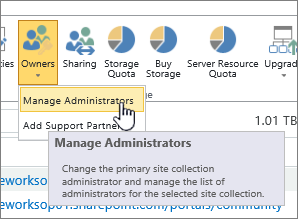 If you're a an admin for a classic site, see Manage your SharePoint site settings. If you're a global admin and want info about assigning other users the SharePoint admin role in Office 365, see Assigning admin permissions. By using the new SharePoint admin center, you can change the owners for sites that use the new team site and communication site templates. You can also add and remove group members in the Microsoft 365 admin center. For info, see Add or remove members from Office 365 groups. In the left column, click to select a site. Select Owners. For a group-connected team site, you can add and remove group owners. For other sites, you can change the primary admin and add and remove other admins. Note that if you remove a person as a primary admin, they will still be listed as an additional admin. In the left pane, under Admin centers, select SharePoint. (You might need to select Show all to see the list of admin centers.) If this opens the new SharePoint admin center, select Classic SharePoint admin center in the left pane. Point to the site collection for which you want to change the administrators, and then select the check box in front of it. Select Owners, and then select Manage Administrators. 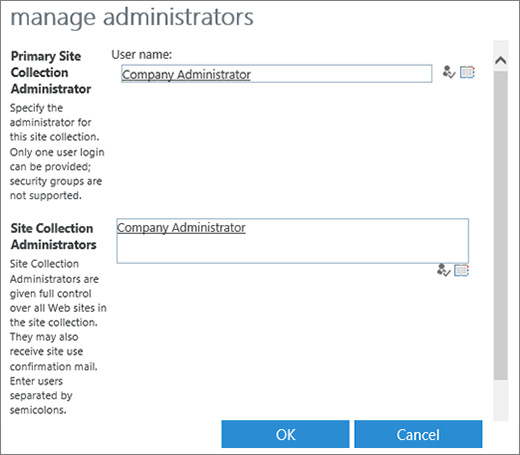 Change the name in the Primary Site Collection Administrator box, or add or remove names in the Site Collection Administrators box. Select Check Names to verify that the user names are valid.